Chlorella is available in the form of tablets, capsules, and powder, and an excellent supplement in the correct dosage. You can take it any form that suits you best, or even use a combination of powder and tablet. For example, you can consume chlorella as a powder in the morning and night at home, and carry tablets with you to take during the day to work or school. Keep reading to learn how and when to take chlorella, but you may also want to check out our article on the best chlorella brands. And here is our favorite healthy brand of chlorella. How to take chlorella depends on what form you are taking it in. Tablets and capsules can be taken with liquid – preferably water or juice. Do not take them with any hot drink and this can interfere with the absorption. If you preferred form is powder, you can also take it with water or juice, like the pills. You can even add it to your green smoothies. Alternatively, you can pepper your yogurt, salads or even cereals with it. Do not add it to any hot food item, or heat up the solid after adding the chlorella item to it. 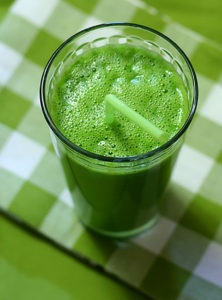 Another rule to follow is to not take vitamin C with chlorella. This is because when you take vitamin C, there’s a possibility of loosening of heavy metals that are bound to the chlorella – and thereby get reabsorbed into the system instead of being eliminated. You should also not take any form of Vitamin C for three hours after your chlorella dose. Different doses work for different people. The correct dosage depends on a number of factors like if you are taking chlorella for a specific purpose of eliminating mercury or other heavy metals from your body based on medical screening results; or to promote and maintain overall health. On an average, the daily correct dosage of chlorella ranges between 4 – 8 grams. Based on the strength of the tablet or capsule, or how much is a teaspoon of powder, you will have to determine how many tablets or teaspoons of powder you will need daily. 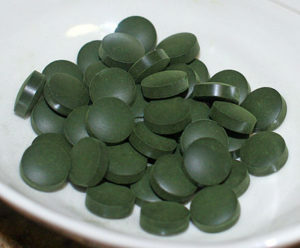 Typically, a tablet of chlorella is 200-250 grams each. That means 4-5 tablets make up 1 gram. You can then add up how many you need throughout the day. The correct dosage for each person may vary. What you all must follow is to gradually build up your dosage, starting with 1 gram daily. Pay attention to how your body reacts and slowly, over the next few weeks, up your chlorella dosage. This is vital to follow. Even when you start slow, you may experience some initial inconvenience like gas, diarrhea, cramping, or constipation. But these soon go away. You can try adjusting the chlorella dosage, based on your reaction, till you settle upon the correct dosage that works best for you. You can take chlorella every single day. You can consume your entire dosage right in the morning – provided you have been taking chlorella for a while and have worked your way up gradually to your optimum amount. Or then divvy up the quantity to be taken in multiple batches throughout the day – which is what I would recommend. No matter when you take chlorella, it works best if you take it half an hour before meals. Chlorella helps the stomach bacteria (that aids in digestion) to multiply rapidly. And that’s why, when you take chlorella just before meals, it improves your digestion as well as aids the absorption of nutrients much more efficiently. Check out our top 3 chlorella brands for every budget next!